View of “Gabriel Kuri,” Galleria Franco Noero, Turin, 2006. 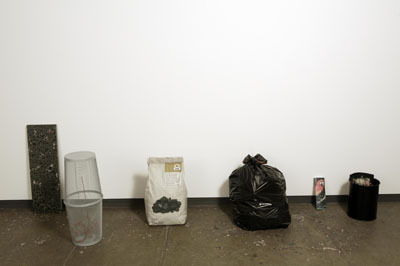 Gabriel Kuri’s latest show at this gallery is an archaeological site for contemporary society: Found objects, domestic appliances, plastic bins, trash bags, and broken objects punctuate the space like remnants of an apocalyptic past. The show brings together a group of sculptures made from commonplace and industrial materials that are often associated with waste and recycling, though they have been organized with a light yet fastidious touch. By assembling the pieces in a pristine gallery and aligning them at regular intervals along the walls, Kuri strips the objects of their functionality, revealing pure, captivating forms. The result is a vibrant tableau that hints at social critique while sketching a modest, nearly aseptic still life of our time. In a second space—a window gallery in Via Mazzini—Kuri has installed three medium-scale sculptures constructed from white, modular panels. Here the artist creates simple yet surreal assemblages, almost Magrittean in their wit: In one, Untitled, 2006, a shoe hovers over a white plane; above this protrudes a baguette and a newspaper page showing graphics of market trends. Next to this sculpture, a sheet of weatherproof tar roll roofs a similar structure, onto which has been placed a condom that alludes to the use of the street as a garbage receptacle. Unlike many artists who craft infernal, chaotic environments from rubbish and found objects, Kuri explores the everyday with a cold, detached style that transforms his materials into carefully controlled permutations—a novel syntax of found objects for the artist’s poetry of the quotidian.